An easy hike leading into one of Arizona's most fascinating geologic formations - how it looks inside of a volcano. Features and Interests: Unique erosion and weathering forces reveal the inside of a cinder cone volcano. Trail Description This trail winds gently upward through a pinyon pine and juniper forest, revealing the cinder rises and red rock to the west. The trail has been very well kept up and is marked by white triangles the whole way. 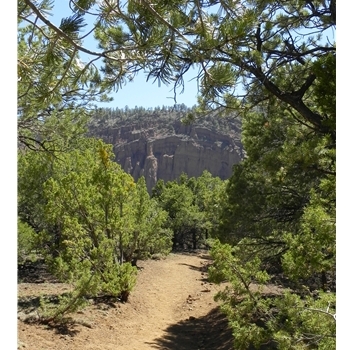 At about the 1 mile mark, the trail meets a natural wash that takes you about 0.3 miles to the center of the volcano. The wash contains many different plants and animals, including a strong contrast of light vegetation lining the black basalt hills around it. You will come up to a large rock formation marking the entrance to the ancient volcano, which you can pass using a ladder over a wall on left, or you can attempt to scramble up the basalt lose rock to the right over the rocks. Onwards, you will find many different rock/volcanic formations which have through the eruption and erosion taken up different shapes and sizes and colors. There is a hardened lava flow towards the south-west of the summit. Accomodations: (on site) Directions: Take the Highway 180 north of Flagstaff. Drive around 33 miles to mile marker 247 where you will see a dirt road turn off on the left. This turn off is marked with a Red Mountain Geologic preserve sign. You will drive about 0.4 miles on this dirt road to the trail parking area. This road, parking and trail is very well preserved. Accessibility: Good dirt road, off-road vehicle not needed.